The storm hasn’t finished, with large winds, snows, rains and storms still causing damage and taking lives over a wide part of the country. Millions without power and mobility. Some without heat. These are the natural questions that lead to preparedness efforts. Over the weekend I spoke with my eldest son Tom KC9JGD about what would he do if his University was hard hit? Does he have a 72-hour pack? Where would he go? Not done with the intention of scaring the young man, but rather asking him “what is your Plan-B if your housing & dining were unavailable?” Simple common sense questions. Was rather pleased he had some ideas and plans, and most importantly saw the immediate challenge of putting together what items and plans he doesn’t yet have. Today my office was abuzz with questions like “do you have a generator at your house?” and “do you keep some spare water & storage food at home?” Great questions and one every head of household should have asked themselves and responded to! What have you done to be ready for the unexpected? If there is interest I will post links to some the resources I have found useful when I have looked into this question. Casual Contesting – 2012 CQ SSB World Wide DX Contest. Has been the CQ World Wide DX SSB Contest. Contest this weekend, and true to form there have been plenty of distractions. Tom KC9JGD had a chance to visit home from University 6 hours drive away, my father needed some help which Tom KC9JGD, Vic KC9NWB and I spent a few hours at, we had a dinner engagement dating from before I realized the contest was this weekend, an appointment out of town that took four hours, the Green Bay Packers had a football game in during the contest (who schedules these football games, really… <grin>) and mother nature through in a charming wonderful weekend of weather begging for one to go outside (and do those chores….) … whew….. Despite the conflicts I did get in two two-hour slots and ran up 50,000 points fairly quickly. This contest is always a favorite as the report is simple – Signal and Your CQ Zone (Click for Zone Map) (mine is 04) and off you go. The rules take a bit of study as you cannot hop around bands on a whimsy, a new Zone or a new Country is worth more than more contacts from places you already worked on that band, and domestic QSOs are basically worthless once you get one per USA Zone. It also is a contest that is good fun whether you work it “contest serious” or “in between all that stuff in life style” like I did. I spent a fair bit of time on 10 meters, picking up a number of first time DX on 10m along the way. Again I used N3FJP’s CQ WW Contest Log Program, which though it lacks in “Eye Candy” having screens like an old Windows 3.21 Program, does the contest logging job precisely and with little bother. I’ve been a bit off contests as of late, having known each contest weekend that I am short of time and have too many conflicts to put in a real effort. The 2012 CQ SSB WPX was almost an afterthought, as I knew I could only get on a short while. When I passed 10,000 suddenly I was self-challenging myself to get to 20,000, then 40,000 points. Knowing I had obligations that wouldn’t move or go away, I raised the bar to 50,000 points and at 153 QSOs I passed that mark up. Yes, only a trivial amount of QSOs. I went unaided (no spots) and just worked listening the band from end-to-end which netted me some great multipliers. Took only a few moments to upload my log to me off-site storage, and to email it to the contest robot. At first I had two errors – nothing in a mandatory “Locations” header line and a typo in the club (Society of Midwest Contesters). The error message was clear and a minute later a successful resubmission of my log was acknowledged by the contest robot. Almost every one of us has some spare radio gear. Sometimes it is gear we would like to set aside and store for a “rainy day” or hoping that our youngsters might want it. Of course there is also gear set aside purely as back-up if our main gear took a lightning strike or was otherwise damaged. I asked several preparedness types, a couple ex-military gear service techs, and looked around for other’s recommendations – all distilled into a protocol. Will it work in the future? No point in storing gear that requires a computer that is likely to be obsolete unless you store a working computer with it. Nor is there much sense to store a project without the needed spares if they are likely to be unavailable in the future. Then pay attention to completeness – you want the gear, all accessories, critical spares, paper manuals, service/tech manuals if you can get them, consumables and printouts of support notes from the internet if they are useful. You want it all much like if you were shipping the radio to a remote Island where you would be setting it up without any outside resupply. Pay attention to special connectors – Molex variations come to mind – and any add-ons that can be found now. The object is to have everything you need to get the radio up and going, AND take care of it, when you open your storage parcel years later. Obviously be prudent – example, I wouldn’t store oils/lubricants with the radio. Don’t forget to really make sure what you store works well, and is up to snuff. One ham I ran into sends radios in for full service and alignment before storage. Really nice to get some of his gear when he decided he didn’t need everything he had stored. Treat the radio like you were wrapping fresh room temperature meat. Bring the gear up/down to room conditions, clean and dry. Then wrap it twice in food grade paper. Butcher Paper and Parchment paper (used for baking) have been suggested. The idea is a pH neutral paper unlikely to take-up or give-off chemicals which could damage your stored radio. To the wrapped radio add the manuals, accessories and spares if being stored as one. Some units will be stored in partial units – which even at this stage would then be marked 1-of-4, 2-of-4 and so on. The add-ons can be in their own paper or bags. To these add several large desiccant sachets, which you should prepare by oven-drying them to a very dry state. Using Food Grade plastic, heat seal and vacuum pack everything. You do NOT need to crank the vacuum up high, just bring it down. Some preparers suggested pre-filling the plastic bag with nitrogen or CO2 from some dry ice. Once you have some vacuum the heat seal the bags completely closed. They shold not puff back out. Double wrap the vacuum pack with commercial grade aluminum foil (this is much heavier) or electronics industry anti-static conductive materials. Use conductive tapes if possible. The foil-wrapped unit is put into another Food Grade Plastic Bag and like the bag under the foil vacuum heat-sealed everything again. Make sure to label the unit, and if you have any short instructions for storage or opening attach them. I’ve put labels so they can be seen through the Final Vacuum Packaging as well as an outside label – hedging again the plastic wrap fogging over time. At this stage advisors were split – several suggested boxed up the package in a storage box, and few wanted to store it in a metal garbage can out of EMP fears. There is no civilian authority to reference on whether EMP threats are real enough to protect against, and whether the double foil-wrap is enough protection without a metal casing. Regardless of your personal decision, make sure you box/store the package in way that you won’t drop it when handling. No point in doing an awesome storage job to fumble the radio putting it on the shelf – or even having it walk off the shelf in tremors. If you do some planning you can use the original OEM packaging, even if you have to include it inside one of the Vacuum Packing layers. The saying is “Two is One, and One is None.” This reflects the idea that you have a high likelihood of havinga working station if you have spares to swap in, but if your only unit goes down you are off the air. The same applies to spares. Consider if you want duplication of stored radio gear. All this is a lot of work, but I am told that those with experience have found it worth the effort. The protected radio gear has a high likelihood of being servicable after lengthy storage. 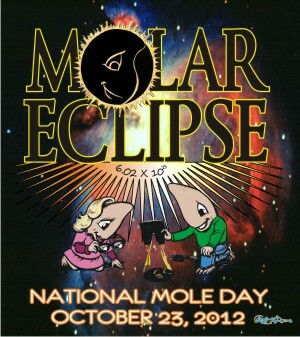 The theme for Mole Day 2021 will be: Molar Eclipse. Celebrated annually on October 23 from 6:02 a.m. to 6:02 p.m., Mole Day commemorates Avogadro’s Number (6.02 x 10^23), which is a basic measuring unit in chemistry. Mole Day was created as a way to foster interest in chemistry. Schools throughout the United States and around the world celebrate Mole Day with various activities related to chemistry and/or moles. To find out more about The National Mole Day Foundation, how to become a member or just to read some mole jokes, select your topic below. 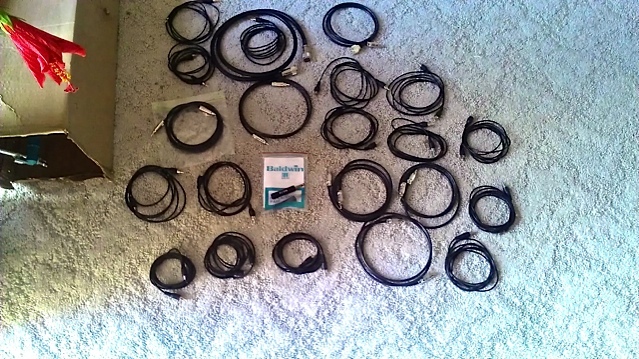 via National Mole Day Foundation, INC..
Collins S-Line Cable Set – A LOT of Cables! Ok, the RCA-to-N is for another configuration and there are three spares included. But what a mass of cable to hook up a basic station! I did order all the cables from the same source, as I wanted a fully matched set appearance and the convenience. That odd RCA-N RF cable and the RCA-RCA RF cables would have been inconvenient to source any other way. With modern rigs we either never have the connections (as more of the radio is in the single box) or have multi-wire connections that interconnect in a snap. Many of us have experienced the mischief of RF in the Shack. Computers that freeze or act badly, distortion on our audio, shack components that lock up or other RF induced issues if we’re only have a bit of problem. RF nipping or burning fingers, electrical things damaged or burt cables if it is really bad. Stray RF in the shack is also considered not good from the health angle, as RF exposure is never a good thing. Some of the causes can be loose connectors, lose of grounding, component or cable failure, cable interaction, overload, or other harder to identify issues. Currently I’m experiencing some RF operational problems, mostly centered on certain 20m frequencies. They started when I switched to the Palstar AT-Auto Antenna Tuner and SPE Expert Amplifier. So first order of business will be to swap each of those out to see if it goes away. Since it is specific frequency areas, I’ll be looking at the cables, including cable lengths next. Also how they all ended up physically. I’ll be double checking by grounding system. Sometimes the physical proximity of shack components (stacking or what is side by side) can cause some issues, so I’ll look at that. If I am still facing issues then, I’ll decide if it is ferrite beads on all the computer cables next. Of course I can minimize operations at the 20m frequencies that are acting up and continue to leave the issue for another day. With the rare exceptional Autumn weather calling for outside work, afraid it will be left for another day.